David Byrne argues that Tartan Toryism is back on the cards. In 2015, Nicola Sturgeon established a Sustainable Growth Commission chaired by the former SNP MSP Andrew Wilson, generally identified with the right and pro-market wing of her party. The Commission’s membership included no trade unionist. Evidently the SNP’s Trade Union Group was not considered relevant as a source of personnel. They consulted with 23 organizations of which 20 represented various forms of business interests. They did not consider it worthwhile to consult with the STUC or with any individual union. The general argument presented is simple enough. An independent Scotland could emulate other successful small nation state economies and through economic growth alone could generate enough production to fund a welfare state on the current scale, reduce inequality and halve the incidence of poverty in the country. Although the Commission included three social scientists, none of them seem to have pointed out the problem posed by path dependency – an important concept which can be summed up in the classic Irish response to a request for directions – if you want to get there you can’t start from here. There is one reference to the problems posed by the transition undergone by Scotland and the UK as whole from being an industrial to post-industrial society but no serious consideration of what is required to address them. The relative lack of any positive industrial strategy from the SNP can be contrasted with Labour’s proposals for state intervention in industrial development, particularly in relation to funding and an industrial training strategy. One favoured international comparison is Denmark’s supposed success with a labour market strategy based on ‘… flexicurity’, which combines highly flexible labour markets (an ability to hire and fire) with a well-developed social insurance scheme and active labour market policy, which provides support for people to find their next job’. Well, Denmark’s system has its real disadvantages for workers. Since the global recession following the financial crash of 2008, it has proved incapable of handling increased unemployment. Its supposed benefits were massively overestimated even before that by OECD and much of the gains were in fact a product of a statistical artefact. However, Denmark, along with most of the other small national economies so praised by the SNP Commission is not Scotland. In Denmark, unions organise two thirds of the workforce and play a key role in labour market policy. There is far more job security in Denmark than in contemporary Scotland. For example, apart from some highly paid self-organised dockers in one port and some students moonlighting as postal workers in Copenhagen, there are no zero hours contracts in the country. Scotland has only 30% of its workforce unionized, now mostly in the public sector. Interestingly in general the small national economies praised by the SNP Commission often have very high levels of union density – Finland 65%, Belgium 54%, Norway 53%, and Sweden 67%. Even New Zealand, by far the most neo-liberal of them (apart from the City States of Singapore and Hong Kong which are really not appropriate comparators) has legislation outlawing zero hours contracts. Flexible labour markets in countries with weak unions mean low wages and this is particularly the case if there is large scale immigration in low waged sectors. It is not immigration itself which is the problem and, given Scotland’s ageing population, there is a lot to be said for immigration on economic let alone social justice grounds, but the combination of an immigrant reserve army of labour with weak or non-existent unions leads to low wages. Britain has one of the most aggressive set of legal constraints on union activity in the democratic world. There is no mention in the SNP Commission’s report of doing anything about this. Then the proposals for public finance made by the Wilson report would require an even more stringent level of austerity than that currently being pursued by the Tory Westminster government. Wilson’s report argued for holding public expenditure growth to 1% below growth in Scottish GDP. Given that current GDP growth is less than 1% that would mean further cuts and the economic indicators, let alone the prospect of a global trade war, do not point to things getting any better. Nicola Sturgeon (Sunday Herald 3 June 2018) denied that this means continuing austerity. There would be even more cutting services of all kinds and slashing public sector employment. The politics of this are important. For much of the second half of the twentieth century democratic governments in industrial societies pursued a mix of economic and social policies which improved the living standards of ordinary people. Strong unions increased the share of economic resources going to workers. From the 1980s onwards this has gone into reverse. Since the financial crash of 2008, we have seen the welfare capitalist states which paid attention to the interests of the many replaced by neo-liberal states which regard the financial markets rather than electoral democracy as their key constituency. Wilson’s commission certainly is of this hue for it argues for fiscal austerity which would lead towards a balanced budget in which Scotland’s current expenditure would be matched by Scotland’s tax revenues. The only allowable borrowing would be for capital expenditures on infra-structure and similar projects and current expenditure would include interest and capital repayment charges. There is some allowance for deficit financing within an economic cycle but the well-known fallacy of composition in which a national economy is equated with a household budget is alive and well in this report. What this means in practice can be illustrated by comparing Scotland with the East of England, a region which is in fiscal balance – revenues equal expenditures – and has a similar population, tax revenue and economic performance to Scotland, making it a good comparator. Scotland has a history of high expenditure on services funded by the Barnett Formula so it spends 11% more per person than the East of England and that is the level of cuts required to achieve a fiscal balance for Scotland. The SNP maintain that a thriving Scottish economy based on a flexi-secure labour market and growing exports would yield the tax revenues to close this gap but recent economic forecasts for all of the global economy, Britain and Scotland itself suggest that this is not likely. Real wages in Scotland are lower than they were before the crash and there are no signs of radical innovation and new sectors for export growth. It may be that the new upper middle classes of China and India will drink more Scotch whisky and eat more smoked salmon but that will not close either the trade or the fiscal gap. It is a pity that Scotland’s high value knitwear industry is in such decline and there is nothing wrong with producing luxury high value added goods for a global market but that is not enough. As always with SNP policy documents, there is a formal commitment in this report to increased equality in Scotland and a reduction in poverty. But this is talking the talk, not walking the walk. Labour has proposed a radical recasting of the tax system so that the great majority of households will pay less or no more and the most affluent and corporations will meet their social obligations. The best Wilson’s report could come up with was a proposal to establish for a comprehensive review of tax in an independent Scotland. The way to reduce inequality is by raising wages – a high minimum wage gets rid of subsidies to low wage employers paid from the taxes collected from ordinary workers in the upper half but not very top of the income range. The SNP commission did recognize that higher incomes for poorer people stimulates economic demand – they spend what they have – but tied all discussion of this to economic growth rather than redistribution. To refer to the small country comparisons again in Denmark the top rate of effective income tax is 56%, Belgium 60%, Finland 58%, and Sweden 60%. Of the European comparators only Switzerland at 42% is less than Britain’s current 47% and the threshold for higher rates is lower in most Nordic countries. We need redistributive taxation and proper taxation of capital to fund the welfare state and Labour knows how to do this. In this respect the Commission’s proposals to continue to use the pound as the Scottish currency in an independent Scotland for the foreseeable future are particularly relevant. That would tie key aspects of economic policy to macro-economic decisions on interest rates and money supply taken by another state. The Commission wants a say but would Scotland get one? Certainly those countries which use the US dollar have no say whatsoever. Of course, with a Tory government that would tie Scotland into austerity and a continuing abandonment of the welfare state. With a Labour government in England and Wales things would become very interesting indeed! Oh – and what about oil? Well, the Commission argues that an independent Scotland should imitate Norway and use oil revenues for a kind of sovereign wealth fund. Here is a prime example of path dependency – it is too late for this to amount to very much. Sure governments under Thatcher, Major, Blair and Brown badly mishandled the opportunity posed by oil but it is too late now and the Scottish Greens have a good case for leaving oil under the sea if we are to move towards a post-carbon economy. In an excellent article in The Herald (30 May) Ian MacWhirter said that if the SNP take up the proposals made by Wilson’s commission, then that is goodbye to any pretence of being a left of centre party. Those who like me voted ‘Yes’ in 2014 because they thought an independent Scotland could become a proper social democratic state on the Nordic model can give up any hope of that. The election of Corbyn and Labour’s return to socialism changed the game – hence my return to the party I was a member of for most of my adult life. The report of the Sustainable Growth Commission puts the tin lid on it. The Tartan Tories are back in force! David Byrne is an Emeritus Professor of Sociology and Applied Social Sciences at the University of Durham. He is also the Treasurer of Ettrick, Roxburgh and Berwickshire Constituency Labour Party. 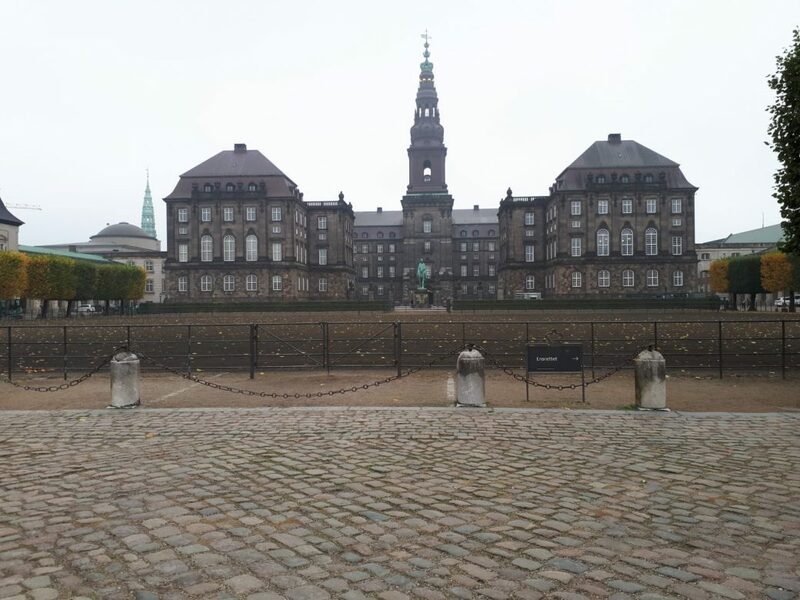 Photograph: The Danish Parliament, Copenhagen.